Bodaboda Baby: "You're an Australian, they have a good heart." Follow-up from my (first, but not my last - shock) boda accident. "You're an Australian, they have a good heart." Follow-up from my (first, but not my last - shock) boda accident. Awww, these people are no fun. Bodabodas a no-no in this zone. I was sitting in Cafe Pap at Garden City, the "Capital of Happiness", or so its sign proclaims (there's also a Cafe Pap near Parliament which boasts the same thing - I still haven't figured out which one is happier) about a week after my boda accident, again enjoying one of their lovely hot chocolates which spoke to me (see pic below), when my phone rang. It was a traffic officer from Kira Road police station enquiring how I was and if I could please come to there now to give him a statement. It was about a week after my accident. I was quite surprised. I never thought I'd hear from the police after walking out of Mulago Hospital after the crash. I was slightly nervous about going in to give a statement, as to be honest I'd heard a lot of bad things about the police. One friend had told me I was lucky that they hadn't asked me for money on the day of the accident. I'd heard stories of people being asked by officers for petrol money and lunch so they could investigate cases. But now that the police were ringing me, although I was slightly scared about talking to them even though I wasn't the one who had been in the wrong, I wanted to go and give a statement as it appeared they were doing their job. The officer on the phone had also mentioned wanting to see what "my interest in the case" was. My "interest in the case?" Ummn, I was the author of what I assumed was the world's only boda blog. I had a lot of "interest" in this case. I wonder if I'd be able to get them to do a guest post? 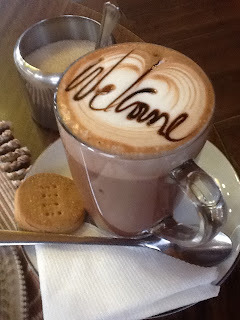 So I gulped down my hot chocolate that had said "welcome" (gone were the days when my beverages greeted me with "hello beautiful", sigh, and walked outside to get Mike, one of my regular boda drivers, to take me to the cop shop. I wanted to take a friend with but there was no-one I could call at such short notice. A boda who knew me was the next best thing. When we got to the station I phoned the officer who'd called me and he told me he was on his way. In the meantime a man dressed in a shirt and tie who said he was an inspector started talking to me and asked me what I was there for. I told him and he took me into a crowded room to wait for the other officer. There were wooden chairs. I expected the officers there to be working on cases on computers, but when the particular traffic officer arrived, wearing a white uniform and black beret, he walked over to the desk with a white piece of paper and ruler, the plastic 30cm type I hadn't used since school. Looking back now, I can't help but wonder will these be the rulers that will measure hem to knee, if miniskirts are actually banned? My hot choc, courtesy of the "Capital of Happiness". "It was a serious accident," the traffic officer said. I didn't need to be reminded although I was relieved to hear that both the driver and the pedestrian, who had been hit when she'd jumped out in front of the bike, were alive and well. After ruling up the page, he asked me to write down my particulars - name, date of birth etc - and then my statement. I wrote down exactly what had happened - that a pedestrian had walked out right in front of a boda taking me from Kisaasi into town and that the driver had no time to stop. I stated that the driver hadn't been speeding and it wasn't his fault. "What are your interests in this matter? Do you want to have that woman taken to court and do you want compensation?" the officer asked. I was completely shocked. I'd only been thinking of a guest post. I don't know why, but I assumed the pedestrian didn't have a lot of money. Then again she could have been Museveni's 12th cousin removed. But I didn't want to have anyone charged - I was just relieved that all three of us were alive and well. 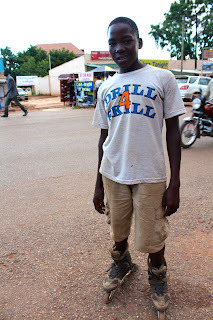 Also I doubted dragging someone through the courts in Uganda was a simple process. So I told the officer no. "Good," he replied. "Because I don't think she's got much." It was a relief to know that I wasn't passing up an opportunity to have a night out at Pyramids Casino with my windfall. "You are very forgiving," the policeman added. Some, like this bloke, are still preferring to skate rather than taking a bike. I made a point of writing in my statement that I was glad that I was wearing a helmet and that more people should wear them, but pedestrians should also be careful when crossing the road, and that I was glad the police were taking a statement off me. After I finished it I signed and dated it. I was relieved when the officer told me that as a result of me stating that the accident wasn't the driver's fault that he'd get his bike back. After all, it was his livelihood. Apparently the boda hadn't been completely damaged and the police had been keeping it at the station. The officer assigned to my case told me in Uganda helmets for passengers were strictly BYO. Who was I, a mzungu, to argue with him? I had my helmet, which I now planned to spray paint bright green (thanks Hilary Heuler, for the idea). Before I left though I thought I'd have a crack at seeing if I could get a guest post for this very website. So I whipped out my my laptop, stuck my dongle in and logged on. Several officers, along with others, crowded around my computer. Smiles spread across their faces, but I was told no they wouldn't be able to write me a piece. I had to try. Since I've failed, I hope this story is good enough. 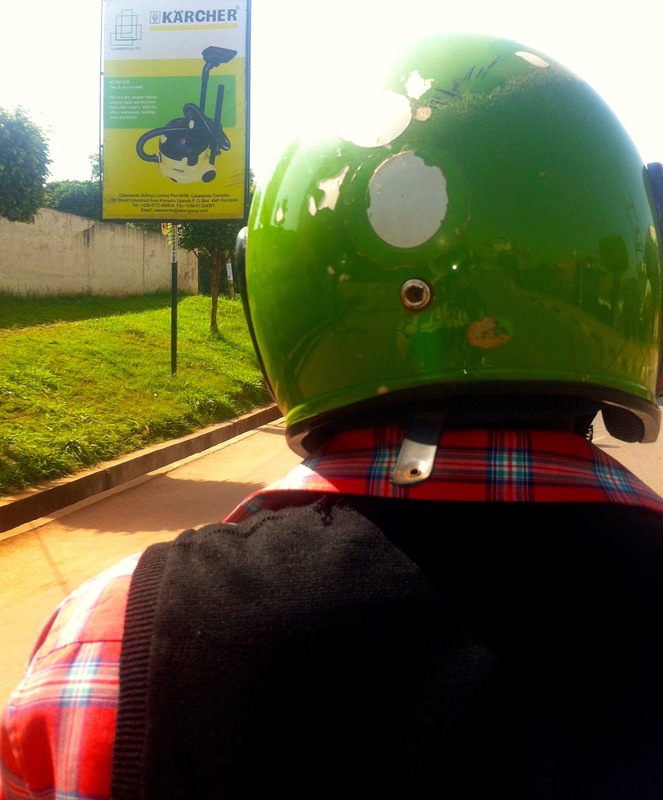 Thinking of spray painting my boda helmet this shade of green. Do readers think it will suit me? As I was putting my laptop in my bag one of the other officers, a tall man who I remembered coming over to me after the accident and asked me, asked me "you are Australian?" "Yes, Sebo (Sir)," I replied. "They have a good heart," he replied. I smiled and agreed, although desperately hoped he didn't mean Austria, as several Ugandas have meant on previous occasions when Australia has cropped up in the conversation, before thanking the police and walking out. I have to say it, but I was walking away surprisingly quite impressed with the police. Two weeks later, I was on my way into town from Munyono when I had another accident. The exact same thing happened, this time as I was being driven through Bunga. My driver (a different one) hit a pedestrian who who'd walked out right in front of him. The bike went over and suddenly I was on top of the rider. Again, thank God I was wearing a helmet, although I now had a cut on my right leg, in nearly the same spot my left leg had been scraped a fortnight earlier. I couldn't believe that I'd been in another accident. To think that only two weeks I'd joked that I'd never pen a blog post titled "My second boda accident". This time I got up, got straight in a matatu and went to the same chemist in Kabalagala that I'd visited two weeks earlier for iodine. She couldn't believe it, either. Oh well, at least I'd have matching legs now. 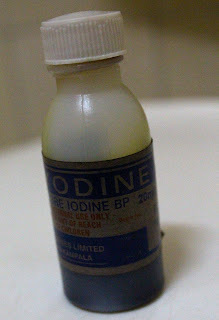 I wonder how many people the world over have gone into rehab for iodine addiction? Things I love in Uganda #110. Now I'm back on a boda, I'm continuing to spot some great roadside fashion, like these lime green jeans... Oh hang on, they're above the knee. Oh well, the fuschia skirt also looks great.